Wow! What a fantastic start to the Sussex County ASA Championships 2017 we have had. Sunday 5th February saw our long distance swimmers William Le Merle, Jessie Brown and Madi Walker in action, with Jessie winning our first Gold medal in the 800m freestyle in a time of 10:15.13. Then on to the first of the two main weekends which saw Kitty Hogg, Emily Carman, Millie Iden, Marissa Netherwood, Becky Smith, Ella Thornburg, Ella Napier, Amelia Atterbury, Daniel Fernandes, Oliver Harvey, Matty Smith, Amber Brown, Tom Hogg, William Le Merle, Ollie Iden, Georgie Howell, Madi Walker, Abby Smith, Stephen Redman, Emily Pryke, Jessie Brown, Jess Frayne, Charlie Hodges, Lewis Smart, and Caleb Grace competing. We were sorry to hear Archie was unwell so couldn’t compete and wish him well. County medals are awarded for the top 3 in each age group (age as at 31st December 2017), with rosettes for places 4-8. Prestigious Championship medals are awarded for the overall Junior (16 & under) and Open (all ages) winners in the 100m events, 200m freestyle and 200m IM. The Junior and Open Championship overall winners will receive trophies at the County awards presentation, usually held on the same day as the County AGM. Age group finals are swum in the 10-11yr, 12yr, 13yr & 14yr age groups for the 100m events. Open finals are swum in the 200m freestyle, 200m individual medley, 100m all strokes and 50m all strokes. All other events are ‘heat declared winners’. Some of the exciting highlights from this weekend…..
We had swimmers in 9 finals: William Le Merle, Tom Hogg (2), Charlie Hodges (2), Ollie Iden, Jess Frayne, Ella Napier and Becky Smith. 4 Sussex County ASA Junior Championship titles won and a further 5 Silver & 2 Bronze Championship medals by Lewis Smart, Charlie Hodges and Jessie Brown. Plus 20 County Medals have been won so far. Lewis Smart (16) won Gold and is the Sussex County ASA Junior Champion in the 400m individual medley in a time of 4:54.63; he won Silver in the Open Championship. Lewis then won Gold and his second Sussex County ASA Junior Championship title in the 200m breaststroke in a time of 2:33.54. He also won Silver in the Open Championship. On a roll, Lewis then won Gold and his third Sussex County ASA Junior Championship title in the 100m butterfly in a time of 1:02.40. Lewis also won Silver in the 50m butterfly and 100m backstroke. He won Silver in the 50m butterfly Junior Championship and Bronze in the 100m backstroke Junior Championship, plus Bronze in his age group 50m backstroke. Charlie Hodges (16) won Gold in both the 50m and 100m backstroke. He reached both open backstroke finals, winning the 50m Sussex County ASA Junior Championship title with a time of 29.35 and stealing Gold in the 100m Junior Championship being the fastest junior in the open final. Charlie also won Silver in the 200m freestyle in both his age group and the Junior Championship. Kitty Hogg (10), competing in her first counties, won two Bronze medals in her 50m breaststroke and 50m freestyle. Tom Hogg (14) won Silver in the 400m individual medley (in an automatic regional time) and 200m freestyle; he won Bronze in the 100m backstroke final and the 200m breaststroke. Ollie Iden (14) won his first county medal coming 3rd in the 100m butterfly (in an automatic regional time). Tom and Ollie provided a very exciting race in the 50m butterfly as we wondered who would finish first out of the two of them – and it was a tie! Both swam 31.13, finishing equal 4th overall. There have been 32 rosettes won so far (including the long distance) by Jess Frayne, Tom Hogg (3), Millie Iden, Ollie Iden (2), Will Le Merle (6), Ella Napier (4), Emily Pryke, Abby Smith (3), Becky Smith (2), Matty Smith, Ella Thornburg and Madi Walker (7). 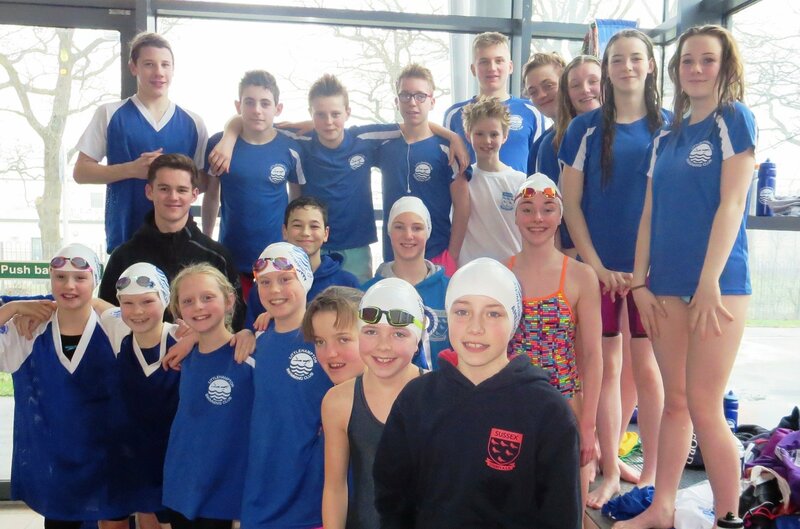 Not including Lewis & Charlie who will swim South West Regionals, there were two automatic regional qualifying times swum by Tom Hogg and Ollie Iden, plus a further 12 base regional times swum by Jessie Brown, Jess Frayne, Tom Hogg, Ollie Iden, Ella Napier and Abby Smith. Our current points position (out of 17 clubs) for the different competitions that are run is below. This includes the County Relay Championship points, long distance and this weekend’s events. Points are awarded for top 8 places only. Congratulations to each and every one of you who swam this weekend! It was a pleasure being there, such a lovely bunch – you were all a credit to your Club. Thank you to all our many lovely helpers both with the team and in county help roles. PS. I have lots more photos, but you’ll have to wait until the annual slide show to see them all!! We will have an official photo call for everyone who swum, with all medals/rosettes, in club kit, for the County Championships, winter Counties and Arena League Team in early March. Date to be confirmed.